Charting the importance of Donny Hathaway to comprehend a soul (and post-soul) aesthetic is perhaps an inestimable endeavor. When coupling this with the fact that almost 38 years after his death, there had been no singular nonfiction monograph that outlined his life and songbook, one acknowledges that such silence likely signifies that there were precisely no words. 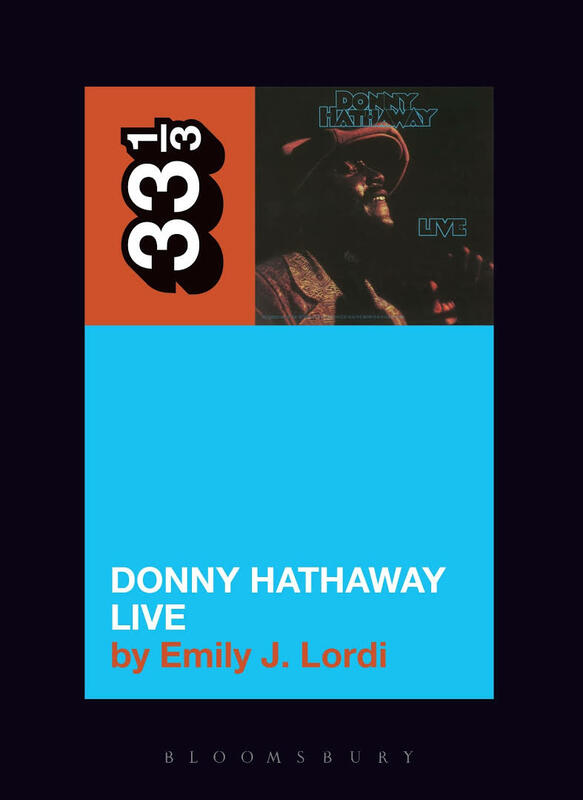 That is until Emily J. Lordi chronicles the politics of his performativity in Donny Hathaway Live (Bloomsbury Academic, 2016; 144 pages). This text—itself miniaturized, hence its inclusion in the 33⅓ series—calculates a kind of mathematics that the previous paragraph already begins to deduce: can an author capture in a bound spine, even fractionally, the sum of an artistic life that concludes with what may have been an accidental, or purposive, flight (97-112)? Is there a pivotal difference between the individual and the collective? How does a genius cultivate an atmospheric product while simultaneously plunging the interiority of his “black melancholy” à la Treva Lindsey (39)? And what is the love quotient that so pervades the ear that listeners feel compelled to conjure a pianistic paragon from a self-professed pear (26)? The fruitfulness of this book is that one never hungers. There is an odd form of anxiety in attempting to explain what the book accomplishes because training, both as a musician and scholar, suggests that formalism is the proper foundation for discursive gymnastics. I venture to surmise that Lordi wrestles with this dis-ease as well when she states in a rather parabolic manner, “The conventional way to tell Hathaway’s story is not to dwell on this somber truth [the “painful irony . . . that the stunning vitality” the Live album “captures would be so short-lived”] but to move past it and end on a positive note . . . But I want to linger in the matter of endings. Doing so is instructive with Hathaway, because he was a master of them” (5). Allow me to make a tumbling pass: Musiq Soulchild has a lyric where he vocalizes: “But now that you’re gone/The story begins/It’s the ending of the end/Of an endless end/”. As one of Donny’s artistic beneficiaries, interpolating giving up in the cause of you and me, he further ponders in the chorus that if you can’t have the one you love, then whereareyougoing in your life? By internalizing this musiqal provocation, I arrive, which is to say dismount, at the notion that by beginning with endings, Lordi provides us with directions for encountering comfort in the fulfillment of the unresolved (119). The music department as a crossroads for preparing the world for soundscapes that soundtracked our lives is nothing short of serendipity; we resound en masse: Thank You Master (For Their Soul) (There). Donny understood the complexity of formalism even as it took on a utility for his own productivity. When he imparts to Victor Rice that American music is BLACK and that European masters lack the SOUL that only black musicians can give (31), his stance suggests that insofar as everything is everything, one could simply replace such a ubiquitous category with the word BLACK, on either side of the verb, and never miss a beat. Being able to recount these moments of black genius not only solidifies Hathaway as an archival artist, but also conceives Lordi as an archivist in her own right. She is immensely meticulous at engendering compassion while filling the rests and stops of the cantata that is Hathaway’s life. The reader gains an exemplar for how to be a fan critically. Likewise, she outlines the stakes of Hathaway’s ethics and how they still hold sway today. This is made clear when she deploys the idea of “getting together” (3), a politics of assemblage or Fred Moten’s construction of the ensemble. What Lordi does, whether one perceives it as subtle or overt, is lay bare the necessary ease of citation. In her estimation, Donny always understood he was in conversation, in partnership, with others, and not the passive receptor of brilliance to then actively engage in improper naming (or none at all). She deftly conveys this affect when speaking about Hathaway’s mental health. The communal enactment of I-we as a mode of honorific is commonplace. Lordi’s search for the first-person singular concretizes the reality the some willingly give up their subjectivity as a metonymic gesture; the transformation from the one to a part of the whole is an object formation which proves that people who choose such a social position can and do resist. This is what Lordi means when she concedes, “Hathaway’s greatest success came through his recreation of other artists’ music [such that it] might reflect this broader history of interdependence . . . submerging the ‘I’ and the ‘we” that was always his implicit theme” (103). Donny’s work ethic surfaces when he makes the calculation that though “he wanted credit and compensation for his work,” he also wanted “to ensure that other artists received theirs” (110). Lordi’s constant signposting of him promoting the genius of his fellow musicians throughout the text (60; 70-1; 111), often at the cost of his own livelihood, situates the blackness of his music and his politics. Getting together, as in self-actualizing, is a precursor to gathering oneself in order to be a participant in a get-together. Blackness in the pocket. In a real sense, then, the Night that happens during the recording session when Hathaway charges white people with stealing his music and sound (109) contrives him as kindred with Moishe the Beadle. And as Lordi further opines: what one diagnoses as “sickness” culturally predates the ill and, in this contemporary moment, has yet to be quarantined (110). But wherearewegoing in our life together? If Lalah Hathaway teaches us anything as the text draws to a close, it might be to locate ourselves at the park for enacting the extraordinary (115). Lordi may be steering us toward something like the experience of a live show to give life to the performer and get our lives from him/her simultaneously. But if we can’t have Donny, the one we love, in the flesh, I believe he offers us two options: a world that gives us permission to get ourselves in gear, keep our stride, in order to sing his greatest songs and keep going, going on; or to meet him in a dream. That may be all we have for all we know. I. Augustus Durham (ABD) is a fifth-year doctoral candidate in English at Duke University, USA. His work focuses on blackness, melancholy and genius. How “Black” Is Your Science Fiction?